Switching between jumping and riding pumps a lot of adrenalin into your body – that is one reason for the fascination for snowboarding. You should not let go of this feeling. No matter how you ride, you will make the most of your possibilities and skills. Draw some clean lines on the slopes with your snowboard! Get your kick! Enjoy harmonious turns and weightless floating in deep snow. Drifting in deep snow and on the slopes will have all your senses spellbound. 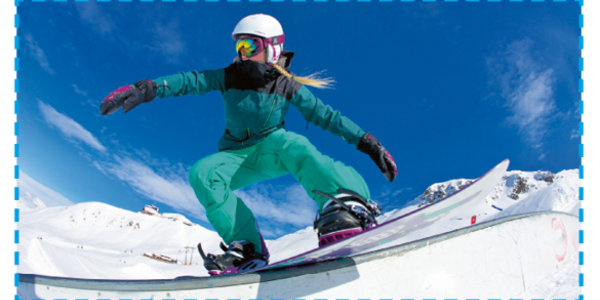 Whether you like racing, carving, riding freestyle or alpine board, you can’t go wrong with any style. Variety is the key! As an adrenaline junky you’ll get your money’s worth. Are you an experienced rider? Do you have your own lifestyle and no longer say “snowboarding” or “trying out tricks”, but “shredding” and “jibbing” instead? Then you really understand the fascination with snowboarding. Do you want to have a look first? No problem. The INTERSPORT Rentertainers will take time for you and your questions. They know what snowboard will bring you that perfect snow joy. Reserve your cutting-edge equipment right now from your couch. The daily free ski service is a given. Ready for take off! Your destination is the fun park or a great off-piste run? With their ski-tips bent upward as well as a very stable construction and reinforced edges, these skis will withstand any snow load. So that nothing stands in the way of your riding pleasure. Release the tiger!